Flowers and candles adorn the Isidor and Ida Straus Memorial on April 15, 2012, the 100th anniversary of the sinking of the Titanic. 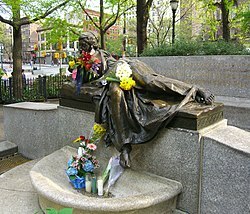 The most notable feature is a bronze 1913 statue by American artist Augustus Lukeman of a nymph gazing over a calm expanse of water in memory of Ida and Isidor Straus, husband and wife, he a United States congressman and co-owner of Macy's, who died together on RMS Titanic. The model for the statue was Audrey Munson. On the memorial is carved a passage from Second Samuel 1:23, "Lovely and pleasant were they in their lives and in their death they were not parted." The passage refers to Ida's choice to stay with her beloved husband, Isidor, rather than get safely into a lifeboat. The Strauses lived in a house at 2747 Broadway, between 105th and 106th Streets, one block south of the location of the memorial. The park exists on a small triangle of land at the intersection of Broadway and West End Avenue. It was known as Schuyler Square when acquired by the city in 1895 and was renamed Bloomingdale Square in 1907. Between 1995 and 1997, Straus Park was renovated and expanded to the west, by the addition of 15 feet of West End Avenue. An endowment established by the Straus family funded the transformation of a neglected reflecting pool in front of the sculpture into a planting bed. The Friends of Straus Park fund maintenance and the planting of seasonal flowers. Straus Park is mentioned in Andre Aciman's novel Eight White Nights (2011). Straus Park is the title of a novel by Belgian author Paul Baeten Gronda, published in 2013. ^ Gibberd, Ben (November 19, 2006). "Taking Refuge Beneath Memory's Gaze". The New York Times. Retrieved October 8, 2009. ^ Reynolds, Donald Martin, Monuments and Masterpieces: Histories and Views of Public Sculpture in New York City (Macmillan Publishing Company, New York 1988), p. 213. ^ a b "Straus Park". Morningside Heights. Morningside Heights, Manhattan. Retrieved April 16, 2012. ^ "Straus Park". NYC Parks. Retrieved April 16, 2012. ^ McCaffrey, Jen (April 30, 2000). "Small Park Acquires an Angel Who Cleans Up, and Sings". The New York Times. Retrieved 2009-10-08. Wikimedia Commons has media related to Straus Park.